I’m sort of proud of myself: I managed to make it 8 days without talking about food. Because, oh boy, am I thankful for some of the delicious food in our life. Today, there are two things worth mentioning: the delicious picnic lunch we had with food to go from The Brotherhood and the local produce I’m still able to buy. Today was a wonderful 65 degree November day. Part of me is ready for scarves and mittens and Thanksgiving, but another part of me is thankful for any last day of warmth we get before our long Nantucket winters. So when we woke up to perfect warmth (and a kitchen still messy from the night before, shhh), I knew we needed to get out of the house. We ended up getting lunch from The Brotherhood and heading over to Children’s Beach for a surprise November picnic (almost as exciting as the surprise day in October when everyone went swimming). Not only am I thankful for the wonderful weather, but I’m also thankful for the Brotherhood. One of the perks of Chris being the chef is that we get to eat for free. I’m incredibly thankful for that, because if he didn’t have that perk, we would literally never eat out for budgetary reasons. The other thing I’m thankful for, the fact that even in November I am still able to buy local beets, cauliflower, scallions, winter squash, and cranberries (for 10% off on Tuesdays!) reminded me that I needed to share this recipe. You’ll be thankful that I did. It’s an easy recipe with a big punch. Warm out of the oven, the filling slides down like pudding; sweet and comforting and the perfect contrast to tart Nantucket cranberries. After a night in the refrigerator, its is more meringue-y with a set, puffy texture; the entire pie just feels so light, you won’t feel bad about going back for seconds…or thirds. Which you’ll do, because it’s that good. Preheat oven to 425F. Stir together flour and salt. Using a pastry blender, cut in butter until pieces are pea-sized. Sprinkle water over of the mixture; gently toss with a fork. Push dough to the side of the bowl until all the dough is moistened. Form dough into a ball. On a lightly floured surface, use your hands to slightly flatten dough. Roll dough from center to edges into a circle about 12 inches in diameter. To transfer dough, wrap it around the rolling pin. Unroll dough into a 9-inch pie plate. Ease dough into pie plate, being careful not to stretch or tear it. Rim to 1/2 inch beyond edge of pie plate. Fold under extra dough or move to “patch” uneven or torn areas. Crimp edge as desired. Do not prick pastry. Makes a single crust. Wash and pick over cranberries. 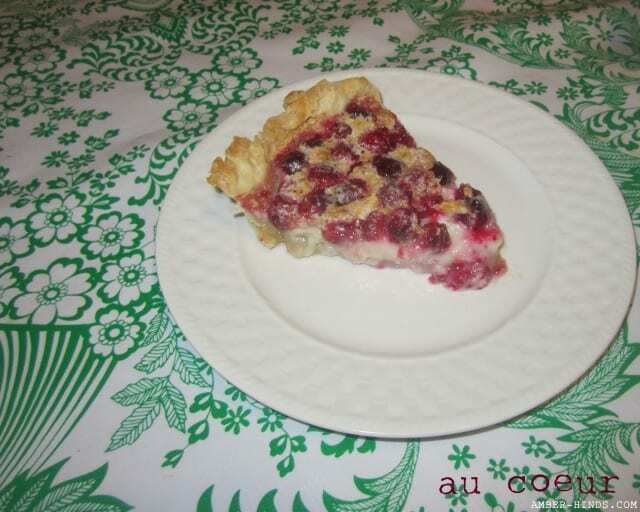 Pour cranberries into prepared pie crust to form a thick layer. Cover cranberries with 1/3 cup sugar. In a medium bowl, sift together remaining 2/3 sup sugar and flour; set aside. In a seperate bowl, beat egg white until stiff peaks form, then slowly fold into sugar, flour mixture. Slowly stir in heavy cream until combined. Pour cream mixture onto cranberries. Bake pie for 10 minutes at 425F, then lower temerature to 350F and bake for about 40 minutes more, until golden and set. Let pie cool (as long as you can stand it) before serving. Next article Wordless Wednesday, 30 Days of Thanks: Upgraded From the Free Phone! Sounds delicious Amber! I’ll have to try it. You are lucky to get top-notch food from the Brotherhood! Have fun with Nora on your walks. Aaah! Cranberries and Nantucket. What could be better? Maybe clam chowder at The Brotherhood of Thieves?? Definitely Clam Chowder from Brotherhood!!! That’s our very first meal on the island whenever we are lucky to vacation there. I wish they would package it and sell it in Colorado!! !